Inspecting your trees for potential problems can save you a lot of time, money and headaches. Winter snow and ice may have put more weight on branches causing damage, while high winds may have torn the branches away from your tree. The dormant season is the best time to check your trees for potential structural problems as the trees are bare, making weaknesses easier to identify. Follow the steps below to ensure you catch all the hazards before it’s too late! Look for branches with a poor narrow branching angle. 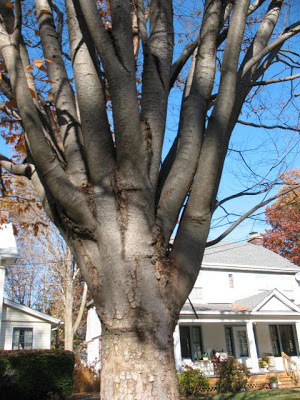 Very ‘upright growing branches’ may be poorly attached to the trunk, forming cracks between the trunk and branch. Check for cracks or splinters near the branch union as these branches are likely to break away from the tree. Compare your tree to other mature trees of like species. Are the branches of your tree too crowded? Do they rub other branches? Do some of the branches compete with one another for the same space? Are any of the branches dead or do they appear unhealthy? If so, pruning is in order. An example of a properly branched mature tree is pictured below, on the left. Does your tree look like this? Or does your tree have crowded branching, like the image on the right? If so, contact First Choice Tree Care to discuss pruning. Assess the overall shape of your tree to determine if it is properly ‘balanced” or shaped to your liking. Assess the stability of trees with multiple trunks by looking for U-shaped connections. U-shaped connections are generally strong, while very tight V-shaped connections are weak and may cause the tree to split. 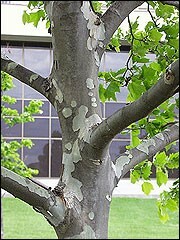 Look for small holes in the bark or loosened bark. These symptoms may indicate insect or disease problems. Identifying these pest problems now will help to prepare a maintenance plan for trees this spring or summer. These proactive care tips will keep your trees healthy all year long!